Are you considering filing an extension for your business taxes? Before you make the decision, here some things to consider and how to file that extension. Even if you file an extension application and file your tax return later, you must still pay your taxes by the due date. You will have to estimate the taxes due and make your tax payment by the due date to avoid IRS and state fines and penalties. 100% of the total tax shown on your last year's return—your last year tax return must cover all 12 months. You must still make your tax payment by the tax due date, even if you ask for an extension. Remember to include any self-employment taxes due on your business income to avoid fines and penalties for underpayment. Should You File an Extension on Your Business Tax Return? The benefits of filing the extension include extending your ability to fund a retirement plan and more time to get a more accurate count of all business expenses to save on taxes. The drawbacks of filing an extension include no extra time to fund an IRA, and you still have to pay the taxes due. If you do not think you can get your business taxes done by the deadline (March 15 for partnerships and multiple-member LLCs, corporations, and S corporations; April 15 for sole proprietors and single-member LLCs), you will need to file an extension. The extension deadline is the same as the original tax return deadline. This also means that if the tax return deadline is changed for a particular year (because the due date is a holiday or weekend), the extension deadline is changed too. Here are the tax return deadlines for the current tax year. To file an automatic extension of time for corporations, S corporations, partnerships, and multiple-member limited liability companies filing as partnerships, use Form 7004. This form requires you to estimate the amount of taxes you will owe. To file an automatic extension, use Form 4868. This is the form used for personal tax return extensions, but it includes information from your Schedule C–Sole Proprietorship Income. Five months for partnership returns (this includes multiple-member limited liability companies filing as partnerships). Six months for corporate returns and s-corporation returns. Six months for sole proprietorships who are filing Schedule C along with their Form 1040, and for single-member limited liability companies filing as sole proprietors. Partnerships and multiple member LLCs must file their partnership returns by April 15. The five-month extension puts the extension due date as September 15. Corporations and S corporations must file their corporate tax returns six months after the end of their fiscal year. S-corporations all have a December 31 due date, so an S corporation tax due date is March 15, and the extension is due by September 15. 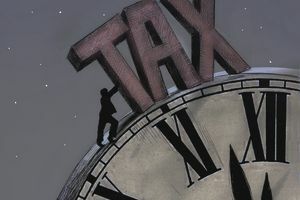 Corporations can have any fiscal year-end, so you will need to calculate the due date for the tax return and extension. As an example, a corporation with a December 31 year-end must file corporate taxes by March 15. The six-month extension is due September 15. Sole proprietorship or single-member LLC (filing as a sole proprietorship) extensions are for six months, so they must submit their extension by October 15.